We first create a diversified, balanced Baseline portfolio that looks beyond the market cap weights of the widely used MSCI and FTSE indexes. We construct a portfolio that is more representative of economic fundamentals and includes other liquid risk premia in addition to equity market Beta. This helps us mitigate the issues caused by booms and busts, such as when Japanese equities represented 50% of global equity market capitalization. We choose asset class buckets that can be matched with low cost, well-constructed index fund and ETF building blocks. For investors who want Elm to dynamically adjust their allocation to equities and fixed income. For investors who want to use Elm’s value & momentum signals to dynamically allocate between equity markets but want a more constant exposure to equities in their Elm-managed portfolio, or who want to manage their cash and fixed-income assets on their own. Sometimes markets offer more attractive long-term expected returns than at other times. Through the use of simple valuation metrics such as the cyclically adjusted earnings yield (CAPE) for equities, or the real yield or credit spreads for fixed income assets, we vary our desired exposure to each asset bucket in proportion to how far its valuation metric is from what we consider fair value, but never by more than 2/3rds of the Baseline weight. While fundamental value drives an asset’s long-term return, in the shorter term we believe that asset prices have a propensity to trend. This may be caused by investors’ tendency to chase returns, increasing their exposure to assets that have performed well recently, and vice versa. We measure momentum for each asset bucket by comparing today’s index value to its one year moving average. We increase the Baseline weight of a bucket with positive momentum by 1/3rd and reduce it by 1/3rd when momentum is negative. After applying the raw value and momentum adjustments described above, each bucket can vary from its Baseline weight by up to +/- 2/3rds due to value and +/- 1/3rd due to momentum, and so the combination of value and momentum can lead us to a raw Target weight anywhere from 0 to twice a bucket’s Baseline weight. Because value and momentum tend to be negatively correlated with each other, the combination of the two produces better results than either on its own. In creating the Global Balanced portfolio, we add up the Target weights of all the buckets and if the sum is less than 100% the remainder is allocated to short-term fixed income. If greater than 100%, we scale down each bucket weight so that the adjusted weights add up to a 100% allocation, with no leverage. For the Global All Equity portfolio, after applying the value and momentum signals we scale the target weights such that we get a 100% allocation to global equities, subject also to the condition that no final Target weight can be more than twice its Baseline weight. 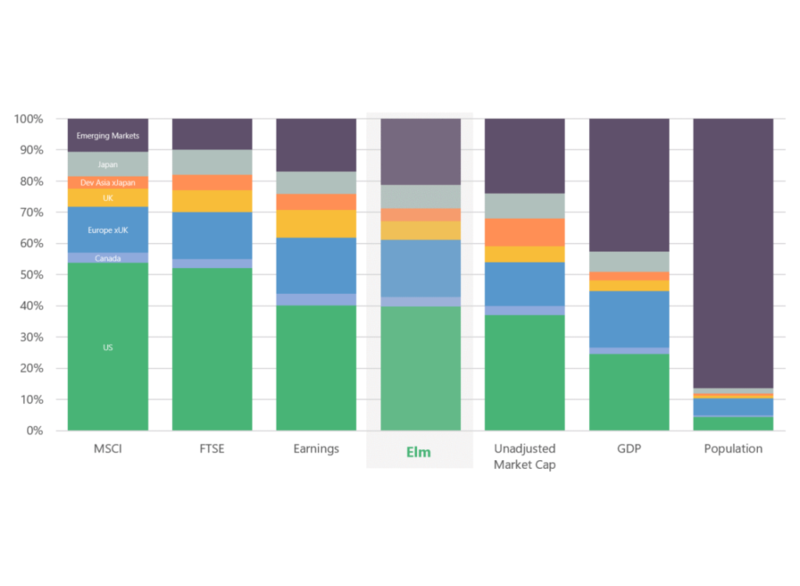 We rebalance the portfolios on a 40-day cycle, while reviewing portfolios more frequently for more micro opportunities to improve their cost and tax efficiency. Trades are created individually for each Elm-managed account, to mutually optimize between minimizing deviations with our portfolio targets, minimizing transaction costs, and for taxable accounts minimizing realized gains and maximizing realized losses. The trades need to be individualized because each account will have a different size, starting point, and tax basis which influence the optimization. From these charts, you can get an idea for how dynamic our asset allocation has been historically. The charts represent a hypothetical portfolio for a US-taxable investor invested through our Separately Managed Accounts at Fidelity. You can find more detailed information about our asset allocation mechanics here and about the All-Equity program here. These charts use simulated data from before Elm’s inception in 2011 and the start of these SMA programs. These past market environments should not be used a prediction or indication of future market environments. Historically simulated data is not indicative of future performance. Your portfolio is held in your own Separately Managed Account at Fidelity*, managed by us. You can start or end your participation on any day you choose. We select the most appropriate ETFs and index funds to express the asset allocation described above, taking into account fund expenses, trading costs, liquidity and the construction of the underlying index. We manage your portfolio in a tax aware manner, weighing the tax consequences of each trade we consider for your account. Accounts are available as individual accounts, joint accounts, or IRAs. We accept clients with a minimum $300k investment1, and charge a straightforward 0.12% per annum management fee. Download our full investor presentation or invest with us online. *Fidelity Investments® is one of the world’s largest providers of financial services. For more information about Fidelity Investments, visit Fidelity.com. Past returns and historically simulated returns are not indicative of future returns. The above methodology example is for a taxable Separately Managed Account. We also manage a Delaware fund and a Cayman fund for Qualified Purchasers, as well as SMAs for US citizens long term resident in the UK. 1 The $300,000 minimum investment is for Individual and IRA accounts. For Trust, Corporation and Partnership accounts, the minimum investment is $1,000,000. Complete the form below to receive our investor presentation. By checking this box and submitting your details, you confirm that you have read and understood our terms and conditions and you are able to receive these materials.